Sometimes you receive a call from an anonymous caller and you don’t know who is calling. Ufone has come up with a solution by introducing Ufone caller check service “Ufone Kaun Hai”. Ufone customers, who subscribe to this service, can identify these unknown mobile numbers on their mobile phone before answering the incoming call. Name of the caller will be displayed on your mobile phone screen as flash message while the call is incoming. It works on both smartphones as well as on traditional mobile phones. No need to install any app on your handset and also no mobile data or internet connection is required for this service. 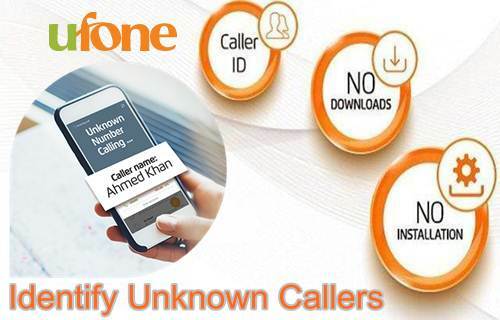 This service is not limited to only Ufone numbers instead it may also show you the names of callers from other mobile companies as Ufone don't use its own customers data base however it uses a global data for this service. This unique service is available for both Prepaid and Postpaid Ufone customers. Just dial *406# from your Ufone SIM to subscribe to Ufone Caller Check service at minimal charges of Rs. 0.99 per day. The service is recursive and will be renewed automatically every day. However, postpaid customers will be charged at Rs. 29.88 per month. User can also SMS on short code 3404 to subscribe. Service can be deactivate by sending an SMS “unsub” to 3404 or by dialling USSD *406# that offers an easy way to unsubscribe by pressing 2. User can also SMS on short code 3405 to un-subscribe. Reply accordingly to modify, add or remove your name and number from Ufone database. Data used to display name is from global database and not from Ufone’s customer database. Flash message display behavior depends on handset type and can vary accordingly. No information will be given in case incoming caller’s data is not available. Service does not take data from users address book. Data is not sourced from any Ufone database. No information given to Ufone as operator by customer at any stage is used for functioning of this service. User can change their number using the service. Non-subscriber can have their details modified by calling Ufone helpline. There are no limitation on the number of calls/ messages that can be received.